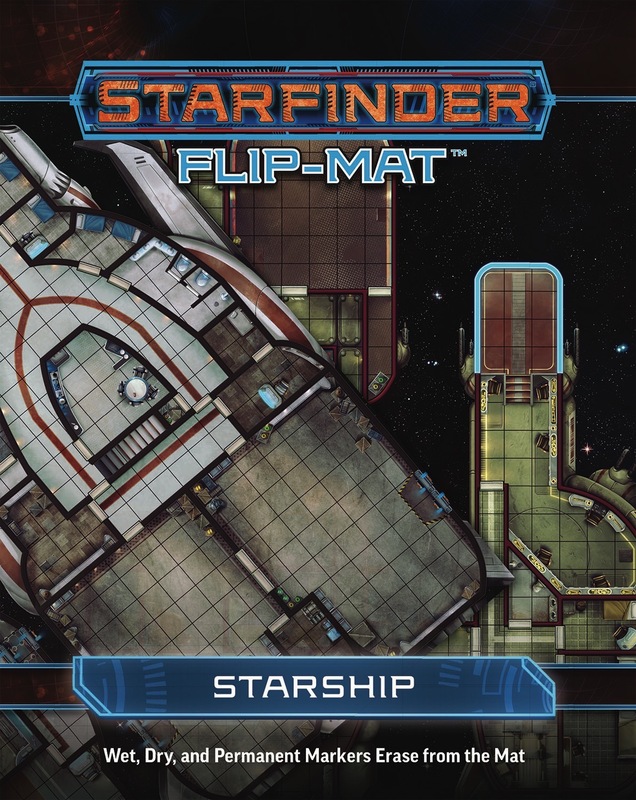 I really love starfinder flip-mats so far and I would like to see more starship flip-mats in future even if their use is pretty situational. - Pricepoint for PDF without anything but the map is high. Probably still great for groups who meet only in-person around a table with minis. *Disclaimer: first time buyer of a flip-mat product, but super-excited about running SF games so far otherwise. Do the ships presented on the maps correlate to specific models of ships from the Core Rulebook? The starships on the flip-mat are meant to be "generic" starships that any GM could use and do not directly correlate to the specific starship models presented in the Core Rulebook. That being said, there's no reason why the mapped ships could not be used to represent some of the ships in the CRB, they just weren't specifically designed as such. It would be great if they were the Drake and the Pegasus from the recent Starfinder Society blog. Is this, or another product, going to be the ship that is in the first Starfinder AP? OR just make one up for your ship. I'm gonna go out on a limb and say I'd love a ton of these, like just a bunch of starship floor plan flip maps, tons lol. 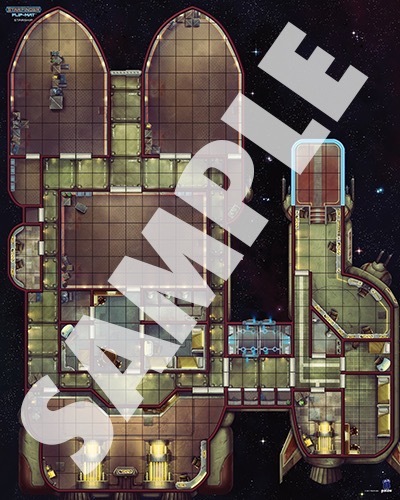 While ship maps are useful; they're nothing compared to the variety of planetside locations that will feature in my APs (so lots more flip maps like the cantina one please Paizo). I've signed up to the subscription (first time I've done so), so I'm hoping my faith in this product line will be rewarded. Deck Plans for three ships are desperately needed. Of course, Paizo's already beaten me to the punch on one of those? I want those three maps, as well. Now the right cover image is back, but the sample art is gone. This was sold out on the first day in my store. Can somebody who has the physical copy reveal if they got it right this time? Assuming by "got it right" you meant "the 1 inch squares are actually 1 inch squares (not cut off on the edges of the map or a different size)" then yes, they got it right. Only the interior of the ships is gridded; the empty space outside of the hull does not have a grid. It´s good to hear that the squares are now as they should be. But i think it´s the wrong decision to not grid the exterior space too. It probably would have to be gridded in another color, but this way only "in-ship" combat is possible and airlock fights and "spacewalks" are hard to do. If people want us to put grids on outer space, we'll put grids on outer space. Sorry for all those "short-sighted decisions," Marco! There has never been a Pathfinder Flip-Mat that hasn't been fully "squared" to my knowledge. This is not a personal thing, Eric and i apologize if i overstepped here. I'm buying every Starfinder and Pathfinder product that Paizo puts out and space battle in zero gravity is a part of the game. So if i get a map that offers only miniature placement on certain areas, but not on others, i feel i have to point that out. If i did that in an inapropriate way, i'm sorry. I don’t think it’s an obvious decision. One way or the other. Although I understand the point of wanting squares outside the ship, the aesthetics of leaving them off is definitely superior, to my eye. Ultimately, I use flipmats for immersion/mood and look is just as important as functionality to me. Since Starfinder armor easily protects PCs from the vacuum of space. I can see the need for grids in space. I already had a situation where a alien was outside a ship trying to get in. I am for grids outside the ship but can make do without them. Black lines on a black background, please! Do we have the stats block breakdown for the vessels on the map? Are these the Pegasus or the Drake? No, these are "generic" starships that GMs can use in their games to represent whatever kind of starship they need. The ships on the Flip-Mat do not correspond to any published ship type or stat block. Can we get stat blocks for the ship? At least ballpark? I am also in the team of not needing "generic" starships without stats. 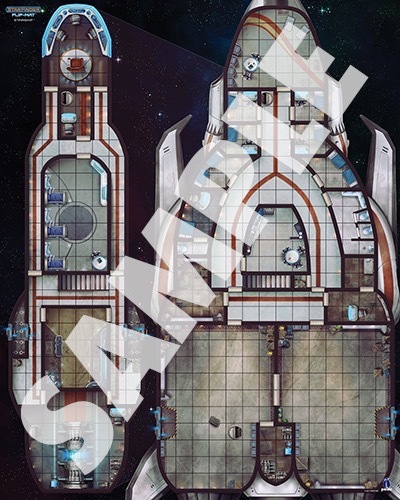 There are more than enough starship floorplans in the APs or in the CRB that need flipmats, i'd rather have those than something generic that i can draw up myself. 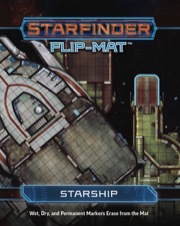 I'm not using the FlipMat for Starfinder, but for FFG's Star Wars RPG, so I personally don't care about the lack of stats, but if I were playing Starfinder, I'd like to see a set that "matches up" with the flip mat. What I'm disappointed by is that there is apparently no drawing of this ship's exterior. I just don't have the design vision to make that leap myself.